Located 15 minutes from central Castlemaine in Elphinstone, Song to the Moon is easily accessible from the Calder Freeway. 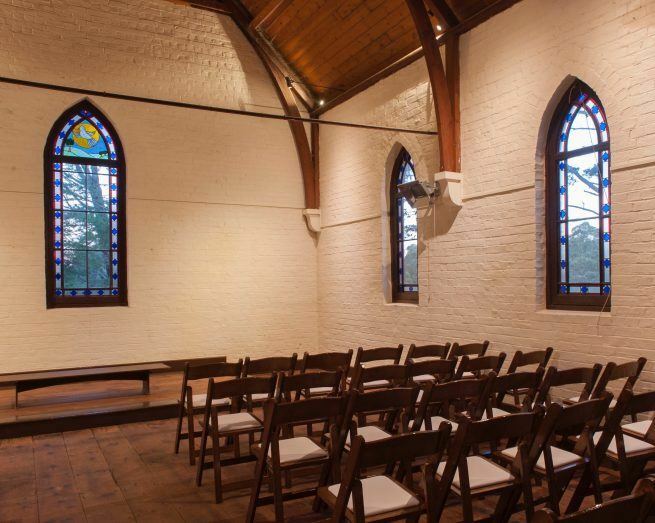 Owned by local artists Jenny Rodgerson and David Moore, this decommissioned triple red brick church built in 1861 has been lovingly preserved with the original wide Baltic pine floorboards, stained glass windows and vaulted timber ceilings. The grounds are abundant with life, celebrating native gardens focusing on endangered local flora. The venue is fenced in so you can bring your dogs if you like! Completely off-grid and accessible, there’s also a fantastic kitchen available for catering purposes. Jenny and David also own Schreck’s Cottage and would love to welcome you into the space when available to get ready or stay the night before and after. Give us a hoy if you’d like to come have a look at Song to the Moon. If you would like your wedding held at Song to the Moon and organised by CWC, please fill out this form. Note: This venue requires CWC event management.